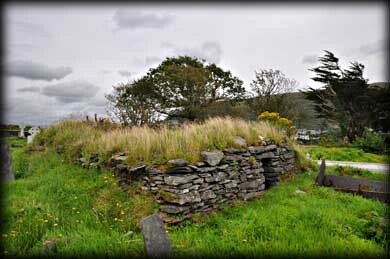 I had read about the existence of a small oratory just outside Cahersiveen, so on our way back from the stone forts at Kimego we stopped at the Killovarnogue burial ground. 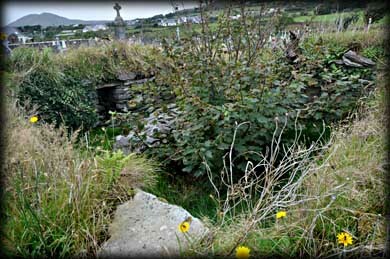 In the south of the graveyard stands the ruin pictured above. Judging by the masonry from the west wall the oratory looks to have been built about the 8th/9th century. As yet we have had no success in trying to find out more information about this small church. We were both quite saddened by the much overgrown condition of the oratory and the surrounding burial ground. Situated: From Cahersiveen Community Centre turn onto Bridge Street. After 850 metres take the first right. Drive to the end of here and enter the Killovarnogue burial ground the oratory is to the right near the back of the graveyard. Discovery Map 83: V 4702 8024. Last visit Sept 2012.